Edinburgh Capitals coach Dmitri Khristich told his players to harness “that winning feeling” as his side broke a 13-game losing streak with a deserved 5-2 victory over Coventry Blaze at Murrayfield last night. The hosts led 4-0 with under eight minutes to play and the manner of the win pleased the Ukrainian. “In other games, there have been times when I’ve felt this team can play with any team in this league and tonight we did that for sixty minutes,” Khristich said. “That’s what we’ve got to do to win, play hard for sixty minutes. In what has been an alarming slump of form, Edinburgh have struggled to even compete in matches let alone win one, and Caps, who led 1-0 after an even first period thanks to Marek Tvrdon’s fifth-minute strike, visibly grew in confidence the longer they remained in front. All three of Edinburgh’s forward lines were working hard, with Craig Ireland getting a regular shift alongside Dillon Lawrence and Juris Upitis. Caps’ experienced Russian-speaking line, centred by Igor Valeyev, was also creating chances and in the 17th minute Coventry goalkeeper Kevin Nastiuk did well to get a glove to and hold a Pavel Vorobyev back-hand shot. Caps began the second period on the penalty kill and under the cosh, Caps keeper Pavel Shegalo doing well to remain composed after a shot cannoned off his face-mask before making a post-to-post sliding save seconds later. Recent signing Nikita Kolesnikovs, now in his second spell with the club, showed good strength to carry the puck from deep out the defensive zone and was hooked for his troubles. It was a poor penalty to take from Coventry’s young English forward Ross Venus, Vorobyev punishing his over-eager efforts to win the puck, scoring on the resulting power-play wristing an effort high beyond Nastiuk. Blaze had the majority of the puck in the second period, but didn’t do enough with it. Tvrdon, with his second of the game, made it three in the 31st minute after an initial Mike Cazzola breakaway had been saved. Blaze could have got themselves right back into the game had Shegalo not stopped two short-handed chances for Jordan Pietrus and Marc-Olivier Vallerand, after Edinburgh got sloppy with the extra man. With Coventry pressing in the third period, Banashkov skated into empty space after he won the puck on the Caps blue-line and stick-handled the puck beyond Nastiuk to make it 4-0 and wrap up the win for Edinburgh with 12 minutes to play. 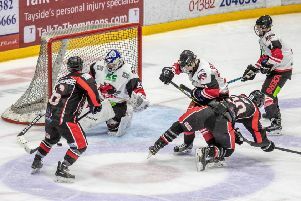 Blaze scored two late consolation goals from Adam Courchaine and Vallerand, before Vorobyev scored Edinburgh’s fifth, into an empty net with three seconds to play.